A debate has been waged among North American hunters for a countless number of years. What is the number one rifle cartridge for hunting big game in North America? In other words, if a hunter wants to choose the best rifle caliber to use on an all-out North American big game slam, what exactly would it be? Hunters and rifle enthusiasts have been arguing about this in bar rooms, gun shops, and internet forums just about as long as men have been hunting with rifles in North America. Although there are many different cartridges out there, and many can be deemed versatile enough for the job, we would all like to know which is the absolute best choice. Here is a list of a few rounds that I think make the cut for some of the best cartridges for hunting any big game animals in North America. The .270 Winchester is essentially the do-all caliber for hunting big game in North America, as well as many other locations in the world. It just does the trick. There’s a reason Jack O’Connor hunted almost everything with it. It shoots flat, straight, and relatively far. Not to mention, the recoil of a .270 is minimal. Modernized variations of the .270 have also come into play within the last few decades, such as the .270 Winchester short magnum. Though this short-action cartridge is just as impressive, it has yet to stand the test of time that the classic .270 Winchester has. The .270 Winchester makes a perfect rifle for any hunter, from a young novice to an experienced hunter. The .308 Winchester is another impressive bullet. Many folks argue that it is one of the best and most versatile calibers for hunting the extremely wide array of big game that North America is home to. The .308 has proven to be extremely accurate and lethal in the realms of hunting, as well as military use. The caliber was initially created for military use, in place of the retired 30-06 Springfield. Both rounds are surprisingly similar in many ways, though their projectiles differ in weight. The .308 Winchester typically fires a lighter bullet, however still provides excellent ballistics. Though the application of a 7mm Remington magnum would normally be on larger big game animals, such as elk and moose, it is a cartridge that can be used effectively on smaller animals when a lighter bullet is used. It is powerful, accurate, and can be very effective at long ranges. The 7mm is a caliber that can be found across the globe – which mean ammo can be found just about anywhere as well. The 7mm Remington is another extremely versatile cartridge that has many applications. 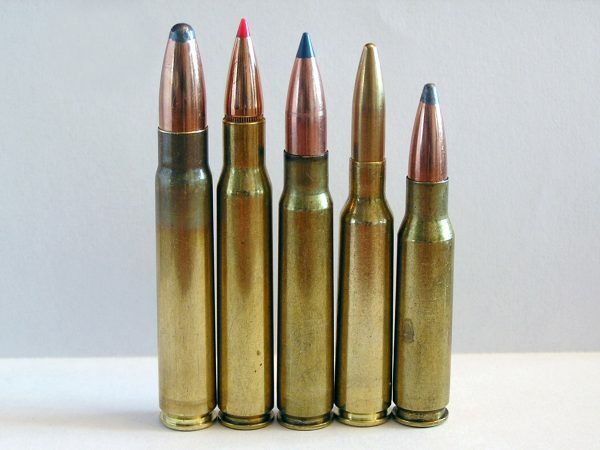 Users of the 7mm often use a variety of bullet weights, depending on what game animals they are hunting. A caliber that has captivated the spirit of the North American hunter – the Winchester 30-30 is a classic example of a timeless caliber. The 30-30 is by far one of the number one most popular hunting rounds in the United States. Though it is a heavy bullet that lacks in long range pursuits, it would be a crime to exclude it from this list. The suitability for its use on large-bodied game has been questioned, however there have been many cases of making for quick kills on moose, in various locations such as Canada and Scandinavian countries. The Winchester 30-30 has been predominately chambered in lever action rifles, which may set a few limits for accuracy, but it still stands as a big game icon to hunters in North America and abroad.